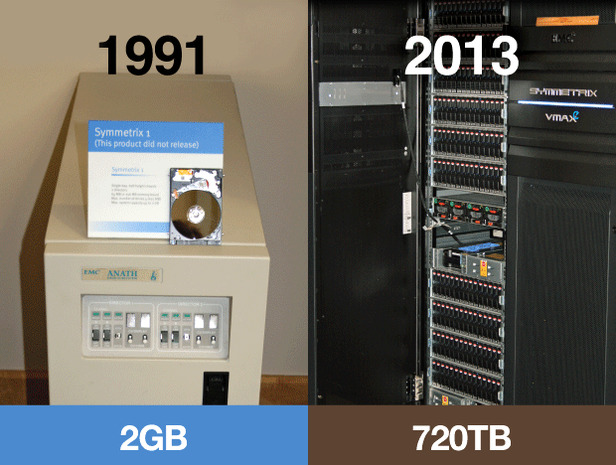 As the size of storage drives shrink, capacity increases -- dramatically. 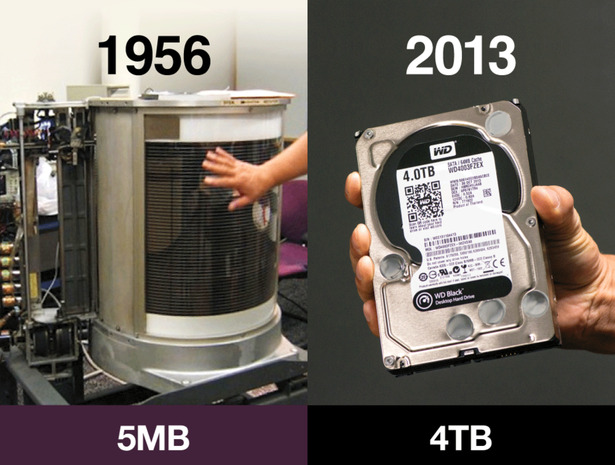 Here is a look at how data storage has changed over the last six decades. How are we keeping up? 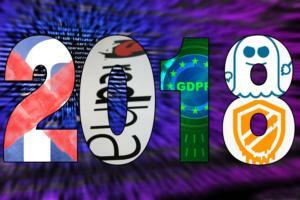 This year, the amount of data will grow to 2.16 zettabytes worldwide, according to IDC. 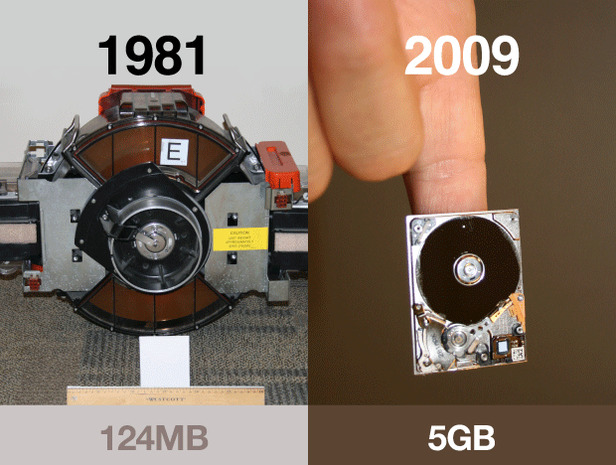 By 2016, it will have grown to 3.77 zettabytes. 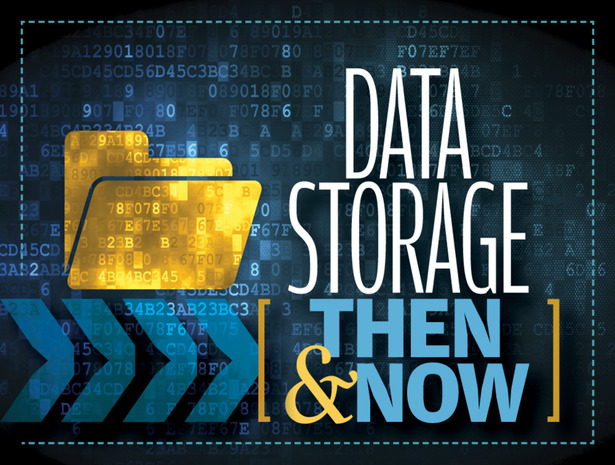 As remarkable as we are at creating data, storage technology has kept up. Data storage is the fastest growing semiconductor technology. Tape storage, hard disk drives and solid state storage have doubled about every 12 to 18 months. Desktop drives today come in storage capacities of as much as 4TB (5TB later this year). That's enough to hold 1 million photos or 562 hours of HD video. 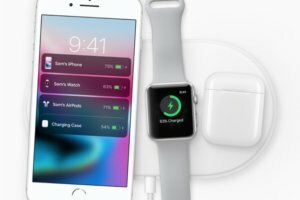 By 2020, Seagate said heat-assisted magnetic recording will lead to a 60TB desktop hard drive, enough storage for 12 million photos or 6,750 hours of HD video. With capacities growing at the rate of 175% annually, and compared with 60-year-old hard disk drive technology, NAND flash memory is still young and on the move. In 1987, Toshiba announced the first NAND. By 1995, the company had introduced a 40MB memory card for cameras. Less than 20 years later, microSD NAND memory cards smaller than a fingernail can store more than 100 billion bytes of data. How much can you store on a 128GB NAND flash card? About 32,000 songs, 27 DVD movies and up to 250,000 photos. While standard planar NAND flash is running up against a capacity wall, 3D NAND promises to continue to grow capacity well into the future. Creative Commons Attribution/Share-Alike License; CC-BY-SA-2.5. In 1956, IBM introduced the first hard disk drive, the RAMAC 350 (Random Access Method of Accounting and Control). The RAMAC 350 had 50, 24-in. disk platters and weighed about a ton. 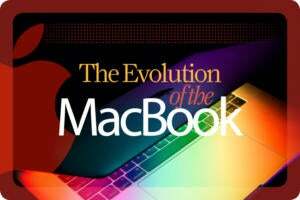 It could store up to 5MB of data, or one MP3 song, at a cost of about $1,000 per megabyte. Today, a 3.5-in. desktop drive can store 4TB of capacity (5TB later this year), or about three-quarters of a million MP3 songs (760,000). Data center drives, filled with helium, can store up to 6TB. Think that's a lot? By 2020, Seagate expects a technology called heat-assisted magnetic recording (HAMR) to afford us 10 times that (60TB desktop drives). That’s enough for 15 million songs or 6,750 hours of HD video. It's hard to believe the first EMC Symmetrix hard drive storage array, built for corporate data, held far less than the typical USB thumb drive today. On the left is EMC's Symmetrix 1. It had four disk drives and held up to 2GB of capacity and had 256MB of memory. On the right is today's 10th generation EMC Symmetrix VMAX. One cabinet holds 240, 3.5-in. disk drives for up to 2 petabytes of data and has 128GB of memory. That's a million times more storage than the first array -- a little more than two decades earlier. The latest storage arrays also offer all flash memory storage with up to 2 million input/output operations per second (IOPS). On top is a Dysan Disk Pack from the 1970s with 200MB of capacity that weighed 10 pounds. The Disk Pack would be loaded into an IBM 1311 Disk Drive (think washing machine in terms of size). The Disk Pack was among the 14-in. disk drive platters that first came into use in 1965. Each disk had 20 sectors. One sector held 100 characters and transferred data at 50Kbps. Fast forward to today. On the bottom is a Toshiba PCIe 512GB NAND flash drive that you can find in a mobile device. It can achieve a 2Gbps throughput with its four PCIe 2.0 I/O lanes. The drive achieves its enormous capacity through transistors that are about the size of an atom (19 nanometers). On the left is the RA80 disk drive from DEC. 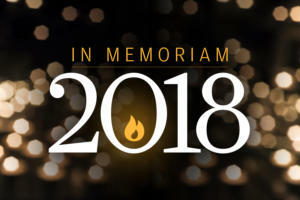 It was among the most popular 14-in. platter disk drive technologies of the early 1980s. The RA80 disk platter had 1,092 tracks with 31 sectors, each capable of storing 412 bytes of data. On the right is a 5GB Microdrive from Seagate. Microdrives, launched in 1999 by IBM, came in 1.8-in., 1-in. and .85-in. sizes and were popular for use in MP3 players, such as iPods. 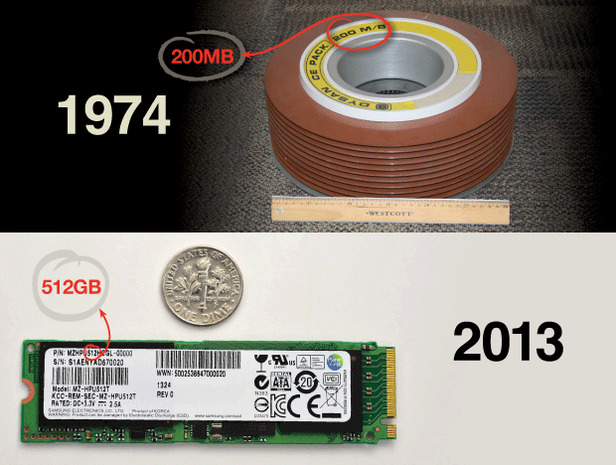 Discontinued in 2009 as NAND flash storage took over in mobile devices, microdrives are a good example of how the hard drive industry has been able to shrink areal densities. Today, a 2.5-in. 2TB laptop hard drive sports an areal density of 760Gbits per square inch. Solid state drives (SSDs) were too expensive for most only a few years ago, but today they cost as little as 50 cents per GB. SSDs are the cheapest way to turboboost a computer. Some SSDs sport data transfer speeds more than five times that of hard drives. 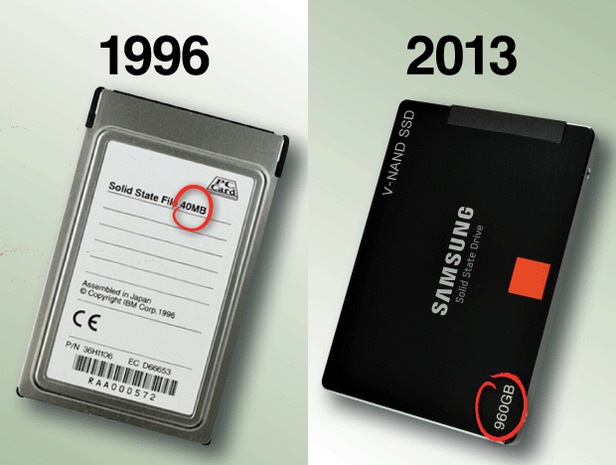 SSD capacities increased as the size of NAND flash transistors decreased, and the number of bits of data stored per transistor grew from one to three. Today, NAND flash transistors are as small as 19 nanometers. A nanometer is one billionth of a meter. As 128Gbit NAND dies, 3D NAND and Resistive Random Access Memory (RRAM) is more widely introduced, consumers can expect a quadrupling of SSD capacity. 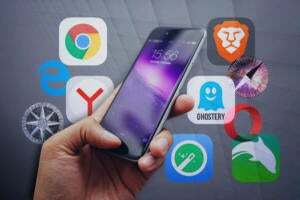 Some day soon, smartphones may come with hundreds of gigabytes of capacity. Since magnetic tape storage emerged in the early 1950s, its death knell has been proclaimed so many times, it's become an industry joke. Tape is still less than half the cost of disk drive storage. 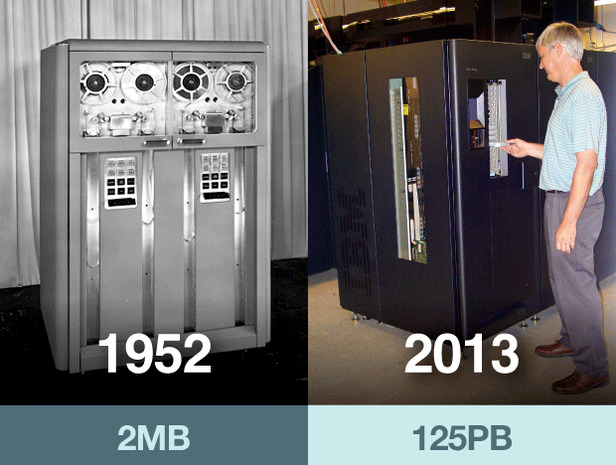 On the left is an IBM 726 tape drive (circa 1952), which held two 1,200-foot long, half-inch wide magnetic tapes. Each large reel could hold 2MB of data. Today, tape cartridges (think 8-track tapes), can hold more than 6TB of data. By 2022, cartridges are expected to hold 128TB. On the right is an IBM TS3500 tape library. A base tape library cabinet can store up to 12 TS1140 tape drives and 260 4TB cartridges, or just over 1PB of capacity -- enough for more than 13 years of HD video.